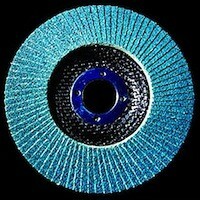 Zirconia Abrasive Flap Discs are excellent for polishing, sanding, grinding and finishing stainless steel, mild / black steel, all metal, plastic, copper etc. These discs are made from Zirconia, an abrasive material which will last much longer than the brown Alumina Oxide flap discs. Discs are available in bulk or wholesale. 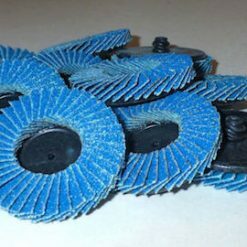 Our Flap Wheels are best used for grinding, sanding and finishing of welds, deburring and rust removal. They are suitable for ferrous & non-ferrous materials. High quality zirconia lasts at least three times as long as standard brown aluminium discs, and they can also be used on stainless steel materials. 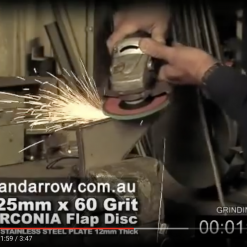 Smith & ARROW Flap Discs can be used on both angle grinders or roloc discs and are available in 2” 50mm / 4” 100mm / 4.5” 115mm / 5” 125mm / 7” 180mm. We sell these wheels in 40, 60, 80 and 120 grits, and also sell a Scotch Brite flap disc for finishing applications. A new product that we now offer is the ceramic flap disc which does not heat as quickly as standard discs and allows for quicker material removal.